From boxing to horse racing, there is something special about being undefeated throughout your career, and Frankel is one of those rare icons in sport that we can say this of. The Henry Cecil trained Frankel raced 14 times in his career, winning each and every one of those races and becoming the highest ranked horse in the world in the process. Frankel was foaled in February of 2008 and his first win took place on 13th August 2010 in the class 4 EBF Maiden Stakes at Newmarket. His next win was in the Class 2 Frank Whittle Stakesin Doncaster a month later. His first major win came just came 15 days later in the Royal Lodge Stakes at Ascot. Although he had a high standard of opposition Frankel’s reputation had already started to proceed him, and he started at odds of 3/10f to win the race. From there things moved fast. 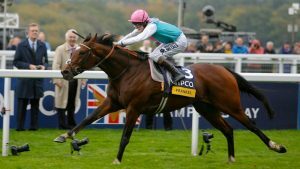 It was on 30th April 2011 that Frankel won the 2000 Guineas at Newmarket, a race in which he started at 1/2 favourite. Further highlights in his illustrious career include at win at Ascot’s Queen Elizabeth II Stakes that same year, and a win in the Queen Anne Stakes in June of the following year. His final two wins were the International Stakes and Champion Stakes where a crown of 32,000 cheered him on. Since 1900 only Ribot has won more races and remained unbeaten. With close to £3 million in prize money this was just the end of a chapter for Frankel, rather than the whole story. Once he had stopped racing his stud fee was set at an eye watering £125,000. It was clearly too attractive an offer to pass up for many though, with 133 takers (so to speak!) in the first season alone. After sire Cracksman won the Champion Stakes in 2017 the fee rose even higher to £175,000. It’s ‘money where your mouth is’ proof of Frankel’s greatness.